Five important things to consider in order to master and fall in love with React. Components are chunks of code that can be combined to provide more complex functionality. When you divide your application into components, it makes it easier to update and maintain. In React, components are even more important: you don’t just program them, you design your app by thinking about how these components fit together. Let’s use the interface below as an example. You can see how it can be divided into three pieces: a box for booking a new appointment, a list view that lets you view the existing appointments, and a search box for looking through them. And that’s also what you’d do in React. You create a single tag ( <div id="petAppointments"> ) that calls a petAppointments component, which then calls the other sub-components as needed. To pass along a configuration object like this, you use the createClass method of the React object. There are two render methods. In the MainInterface class, we declare the items that will be sent to the browser and the ReactDOM.render method replaces the <div id="petAppointments"></div> element in your HTML with React’s code. We would then write the code that handles each of our three sub-components. Components make code easy to write and maintain. Once you learn to think of and organise your apps as a series of composable components, building complex applications becomes simpler. We can use this code to output our appointments. This feels a lot like using a regular templating language, so other than learning a few minor idiosyncrasies about JSX, you can pick it up quickly. The third mind shift is learning to work with state in React. State is stored on the topmost component of your application and manages what’s happening in your app. There’s a special method called getInitialState where you can configure what happens when your application starts. It looks like I’m setting up global variables for my application but modifying these variables actually controls how components render. If something in my app changes the value of a variable, my components will re-render. If the value of orderBy changes, for example, the list of appointments will reorder. The component is only concerned with two things. First, showing the list of appointments based on the current state of the application. Second, handling a click on one of the red ‘X’s. Clicking on the ‘X’ will push a change to the application state, causing this component to re-render. I’m not worried about what’s happening with the data, simply with how the current data will be displayed. The list component is only concerned with listing things. It doesn’t have to worry about what’s happening elsewhere. It’s a brilliant way to build applications and once you get the hang of it, you’ll see why it’s a superior way to code. This is a simplified version of the module that creates a list of appointments. Our list has a Delete button, which we manage through an event handler. This is a special React version of onclick. Our event handler calls the function handleDelete, which is local to the sub-module. Our local function simply creates a reference to another function in an object called props. Props are how main modules communicate with sub-modules. And then you create your own method in the main component to handle the change to the application’s state. Keeping state in the main module helps make your sub-modules more efficient. It’s also easier to maintain code because most of the action happens in one place. One of the best things about React is the way it manages the rendering of your modules. Your modules don’t have to worry about updating the DOM, only about reacting to the state of your application. When state changes, React re-renders your application’s components. It does this by creating its own version of the DOM called a Virtual DOM. But sometimes you need to be able to do things in response to the rendering lifecyle. Enter lifecycle methods. These are ways to ask React to handle tasks at different points in the application’s execution. Here, componentDidMount enables you to execute something after the initial rendering is complete. This is a great place to load AJAX contents, set up timers and so on. There are lots of other lifecycle methods that allow you to trap the execution of the application at different points. They are necessary because of React’s Virtual DOM, which is a great timesaver when building apps. 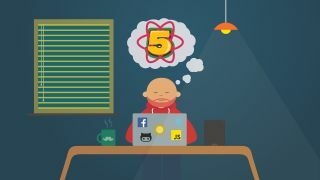 React requires a rethinking of the way you work with web applications but if you focus on mastering the benefits of these five mind shifts, you’ll quickly learn why the library has become so incredibly popular and is a fantastic way to build interfaces. This article – illustrated by Ray Villalobos – was originally published in issue 286 of net, the world's best-selling magazine for web designers and developers. Subscribe to net. Want to further refine your React skills? If you're interested in learning more about React, make sure you've picked up your ticket for Generate London from 19-21 September 2018. Having founded React Academy to teach React around the world and launched sizzy.co and ok-google.io, Kristijan Ristovski will be delivering his workshop – Learn How to Think in React – in which he will explore React best practices and teach you solutions to real problems that you might encounter in the process of building an app.